Enjoy this innovative, attractive and versatile range in your home today. 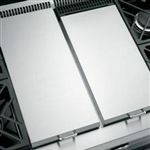 There is a reason that professional chefs around the world choose gas surface cooking, and that reason is control. 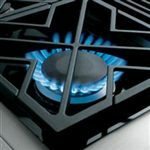 With gas, you have the utmost control over the cooking process, and this unit features sealed, dual-flame stacked burners that give you the control you need to make you dishes uniquely your own. 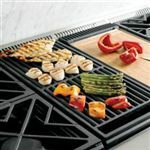 This unit incorporates a griddle, which is a versatile and convenient cooking surface perfect for cooking family-style breakfasts, hot sandwiches, sauteeing vegetables, and long list of other foods. The unit also features a grill, which allows you to bring outdoor-style cooking indoors during all months of the year. Enjoy grilled steaks, vegetables, and a host of other foods, and cook them in the comfort of the kitchen. 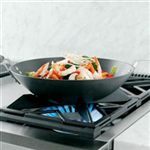 Another great feature incorporated by this range is its reversible burner grates, which accommodate both flat and round-bottomed cookware. 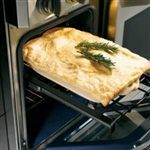 The range features dual ovens: one large, caterer's oven and an everyday oven the perfect size for casserole dishes and pizzas. Both ovens are self-cleaning and feature a dual-burner convection baking system that ensures even, consistent results time after time. 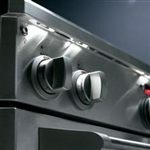 The halogen light columns provide clear light on every level and with any rack position, so you can always keep an eye on the cooking process. 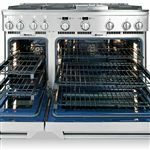 Aesthetically, the unit is graceful and elegant, featuring a stainless steel exterior with smooth edges, heavy-duty handles, and large electronic control knobs. The Professional Ranges 48" Freestanding All Gas Range with 4 Liquid Propane Burners, Grill and Griddle by GE Monogram at Jordan's Home Furnishings in the New Minas, Halifax, and Canning, Nova Scotia area. Product availability may vary. Contact us for the most current availability on this product. 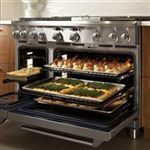 Upper Oven Capacity 6.2 Cu. Ft.
Lower Oven Capacity 2.7 Cu. Ft.
Total Oven Capacity 8.9 Cu. Ft.